Washington, D.C.- Eight major household brands such as PZ Cussons, Johnson & Johnson and Kraft Heinz are refusing to say where their palm oil comes from, despite promising to stop buying from companies that destroy rainforests. Eight others, such as Nestlé and Unilever, have made their palm oil supply chains more transparent. “Brands have repeatedly promised to end deforestation for palm oil by 2020. With less than two years to go they are way off track. Some, such as Nestlé and Unilever, have at least come clean about that. 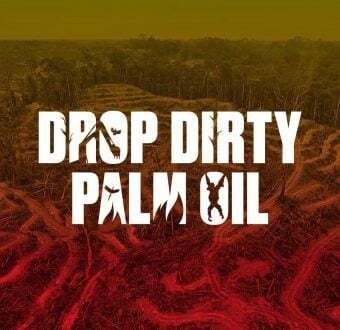 Others, including PZ Cussons, Johnson & Johnson and Kraft Heinz, are still keeping customers in the dark,” said Kiki Taufik, Global Head of the Indonesian forests campaign at Greenpeace Southeast Asia. In January 2018, Greenpeace International challenged 16 leading brands to disclose their palm oil suppliers, along with the mills that produced the palm oil they used. This would show whether brands continue to source from forest destroyers. Eight brands have now disclosed this information. Eight refused to say where their palm oil comes from. “Despite corporate commitments to reform this dirty industry, palm oil remains a high-risk commodity. Brands need to come clean about where their palm oil comes from and cut off growers that refuse to change their destructive ways,” said Kiki. Greenpeace analysis of official government data suggests that Indonesia has lost 24 million hectares of rainforest between 1990 and 2015. In the last three years to 2015, 146 football fields of rainforest were destroyed every hour. Indonesia has more threatened and endangered species than any other country, largely due to the destruction of their habitats. The Bornean orangutan population has decreased by half since 1999 with over 100,000 individuals lost in the past 16 years. In 2017, a new species of orangutan was discovered in Sumatra, but it is already endangered. Forest and peatland destruction by the plantation sector have created the conditions for devastating forest fires, many set deliberately by companies clearing land. In 2015, Indonesia suffered devastating forest fires, which spread a toxic haze across Southeast Asia, resulting in an estimated 100,000 premature deaths. 4. Eight brands were prepared to hold themselves accountable: Nestlé, Unilever, quickly followed by Colgate-Palmolive, General Mills, Mars, Mondelēz, Procter & Gamble and Reckitt Benckiser. Eight other brands: Ferrero, Hershey, Kellogg’s, Kraft Heinz, Johnson & Johnson, PepsiCo, PZ Cussons and Smucker’s – have so far refused to reveal what mills their palm oil comes from.